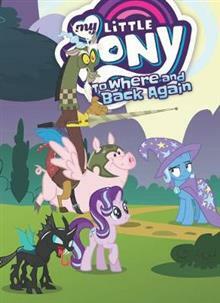 Adapting the most beloved My Little Pony animated cartoon episodes to graphic novels! My Little Pony comes to bookshelves! Revisit the inhabitants of Equestria and learn about the magic that friendship brings in this adaptation of the television series' sixth season finale! This volume adapts the two-part To Where and Back Again in an original graphic novel.